Windows 8 was an ambitious project. The OS attempted to merge smart phone, tablet and desktop concepts into a cohesive experience. Microsoft should be applauded for trying something new but, in reality, Windows 8 is two OSs bundled as one. Few would disagree. I’ve been using the OS for seven months and, while it feels comfortable now, those initial weeks without a Start button were disorientating. Metro can be — and still is — quirky on a standard desktop PC, but I rarely use Metro apps other than the media player. If you’re in the industry, you’re paid to use technology for its own sake; learning something new is part of the course. However, for most companies, technology is a tool which helps them achieve business objectives. Unless there are clear commercial benefits, the costs associated with changing that tool and retraining staff are prohibitive. I suspect people new to PCs actually grasp Windows 8 concepts better than older versions of the OS (clicking Start to shut down was an obvious metaphoric breakdown). Unfortunately, most people have used Windows before; they can understand evolution but revolution is a different matter. Besides, if you absolutely must learn something new, why not try Mac OS or Linux? It’s impossible to determine figures but I’d be amazed if Windows 8 sales matched those of Windows 7. Fortunately, Microsoft has listened to user criticism. Pre-release versions of the next version of the OS, codenamed Windows Blue, were leaked on to the web recently. Microsoft won’t make any public comments, but hinted a preview release could appear in June. Version 8.1 is the most likely name but many of us old hands will think of it as Service Pack 1. I rarely miss the Start button now I’ve created appropriate taskbar shortcuts and use the keyboard Windows key to access the Start screen. The new logo-shaped Start button will probably do the same as the lower-left screen gesture, but having a button present will reassure many people. Microsoft was criticized for showing the Start screen rather than the more familiar desktop after login. It’s a minor point since launching any standard application will instantly switch. That said, a new “boot to desktop” option will bring joy to many. Start screen tiles are currently either “larger” or “smaller”. Even the small size doesn’t permit many icons on a desktop display so a new icon-sized tile will use a quarter of the space. Interestingly, a new super-sized option may also appear which could provide some interesting possibilities for live tiles. Many of the existing Metro apps will be updated and a new video editing application could appear. The OS should also include better SkyDrive integration. I’ve been impressed with Microsoft’s DropBox-like online file storage system and I suspect an increased number of applications will be SkyDrive-aware. IE11 is a more exciting prospect although there’s no guarantee it’ll reach the final build. If expectations are correct, the new browser will fill the final missing gaps in IE10 — namely a few minor HTML5 features and WebGL (it’ll be interesting to hear how Microsoft engineers overcame the WebGL “security issues” they identified). The current tools are adequate but clunky and ugly when compared with Firebug, the Webkit Inspector, Dragonfly or any other Microsoft development software. The company is enticing users back to IE but projects such as modern.IE a solid set of development tools will get developers on-side. In summary, Windows 8 is changing but don’t expect it to revert back to Windows 7. Time will tell if the updates are enough to convince buyers. Are you using Windows 8? Do you prefer it? Do you detest it? Do you want your Start button back? 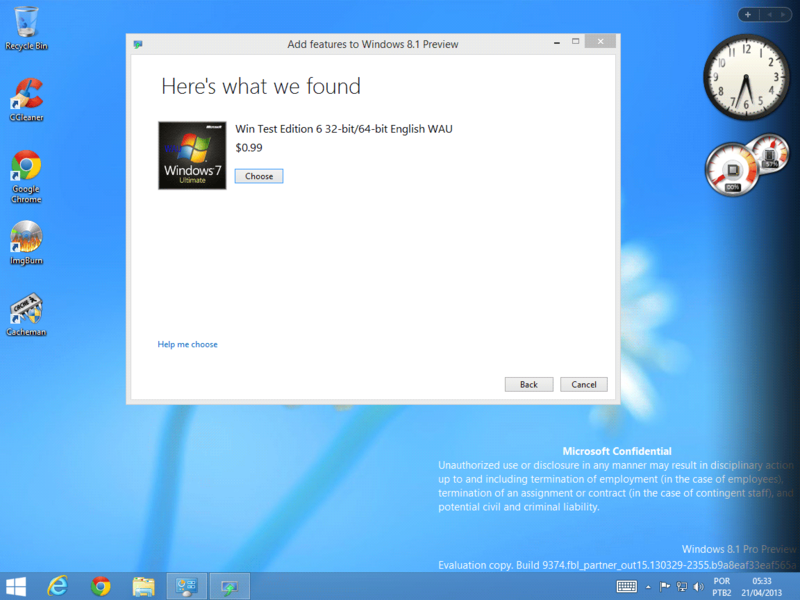 Will Windows 8.1 address your concerns?